A look at Fishlab's console-sized update, set to explode on iOS August 30. Mobile game developers release updates on a regular basis, the majority of which add an hour or two to our favorite apps. Fishlabs, on the other hand, dreams bigger. The talented studio's critically-acclaimed iOS space adventure, Galaxy on Fire 2, is one of the few shining examples of a console-sized experience on a smartphone and tablet, with 15-20 hours of play time, if you consider the original effort, along with the ambitious Valkyrie update. Now the team's at it again, this time with Supernova, a colossal piece of downloadable content that tacks an additional 10 hours onto an already feature-packed title. Not that we're complaining, of course. Supernova still revolves around hero and fighter pilot Keith T. Maxwell, along with love interest, Carla Paolini, and his faithful companion, Mkkt Bkkt; in fact, the update picks up right where Valkyrie ended. This time, the game transitions to the Midorian rebels and their struggle against the Nivelian Republic, as well as a potentially devastating supernova; a mysterious group of stealth fighters also enter the equation. To that end, Maxwell aids the Mido Confederation's battle for freedom, which more often than not will involve piloting a variety of ships new and old through the universe, blasting enemies and protecting allies from harm. That said, players discover that older characters have graduated to different positions. Fishlabs also plans to introduce fans to new faces, including an awkward professor by the name of Thadellonius Moonsprocket and his psychiatrist, Brillo Lampeter. Apparently, the duo's misadventures provide necessary comic relief to the plot, though they play a much bigger role in Supernova; this remains to be seen. Beyond that, players can expect a super-sized effort when it comes to all manner of content, including new star systems comprised of an untold number of planets. What's especially cool about this is the new attention to detail within the skyboxes, allowing users to take in such wondrous sights as storm clouds, complete with lightning. On top of that, some planets now have 3D asteroid belts. Meanwhile, new debris fields come with hidden containers that, when hacked, reveal hard-to-find loot; gamers can also hack space stations and freighters. 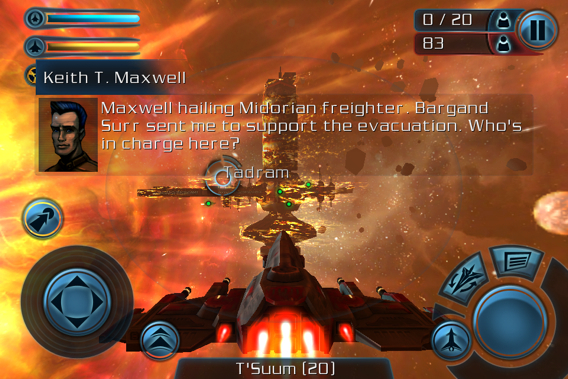 Hacking is but one new mini-game in Galaxy on Fire 2: Supernova, the next involving Gas Cloud Mining. This one tasks players with finding (via gas cloud scanner) and collecting different types of gas that they'll vaporize using ionization missiles. From there, gamers can collect valuable plasma with a plasma harvester (works like a vacuum cleaner) before it evaporates. If that's not enough, Fishlabs will also include bounty hunting, where players scour different star systems in search of scum, the goal to capture and then turn these lowlifes in for valuable credits. Kick starting this new career, though, involves gaining the trust of the Terran Federation. Do that, and players gain access to the group's servers, which are full of names and travel destinations. Naturally, none of them intend to go quietly, so expect lots of dog fighting as you blow their minions to smithereens. 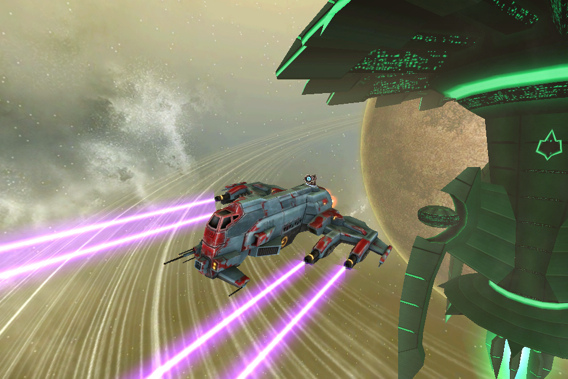 Success not only results in cash, but also access to new ships, including one called the Bloodstar, currently captained by the mean multipod Qyrr Myfft. Thankfully, Supernova comes with new weapons to play with, starting with the Shesha, which unleashes multiple rockets that spiral towards their intended targets. There's also a Shock Blast that works in similar fashion to an electromagnet pulse (EMP) that takes down enemy defenses while dealing a specific amount of damage. As for the update's title, Supernova, radiation plays a huge factor. 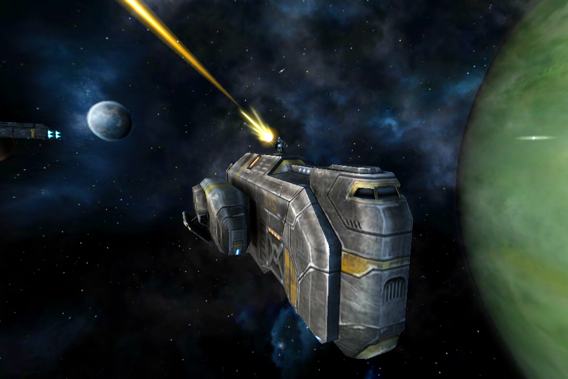 A Radiation Level deteriorates over time, and players must rely on a Gamma Shield to protect the hulls of their ships. 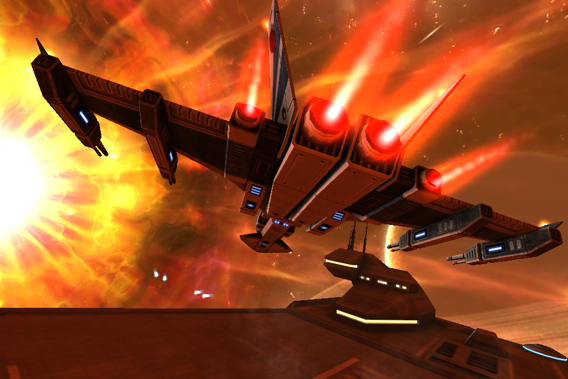 Players will need that and more to take down those aforementioned disappearing ships known as Ghost Fighters. Thanks to a powerful cloaking device, these guys often disappear from radar, forcing gamers to be extra careful while protecting and repairing drop shops, yet another new mission type that may also involve evacuating people in distress. How Maxwell interacts with non-player characters is entirely up to the player, and with more secrets to reveal, Fishlabs appears to have plenty in store for iOS fans when Galaxy on Fire 2: Supernova debuts August 30 across all versions (standard and high-definition) of the game. All we know is this: nothing sounds better than hopping on the couch, plugging in some headphones and happily losing ourselves in this deep and visually-stimulating journey.